2. Crown Inspection — After cleaning the barrel, inspect the crown with a magnifying glass. If you see any unusual wear, abrasion, or “shark’s teeth” at the very outer edge of the rifling, make a note — it may be wise to recrown the barrel next spring. Before you place your rifle in the safe, we recommend putting a piece of electrical tape or blue masking tape loosely over the muzzle to protect the crown. This is just to protect the delicate crown during handling — you are NOT trying to seal off the bore. 5. Bolt and Action – Clean the gunk off your bolt and raceway in your receiver. Put a thin coat of anti-corrosion product on the bolt, and re-grease the lugs and camming surfaces as recommended by the manufacturer. Don’t forget the fasteners and pins on the action and scope rail — these may not be stainless even if you have a stainless steel receiver. 8. Use Gun Sacks — We put rifles and pistols in Bore-Store Gun sleeves. These thick, synthetic-fleece sacks cushion your guns, preventing nicks and scratches. The breathable fabric wicks away moisture, and the fibers are coated with corrosion inhibitors to help fight rust. Bore-Stores are offered in a wide range of sizes, so you can find something to fit everything from a Snub-nosed revolver to a 32″-barrelled 50 BMG. Rifle-size Bore Stores can be purchased for $10.00 – $22.00 from Brownells.com or Amazon.com. While we prefer Bore-Stores for regularly-used guns, if you have heirloom firearms that will be kept in storage for very long periods without seeing any use, you may want to grease them up and place them in the thin, but rugged three-layer storage bags sold by Brownells. Here’s one VITAL bit of advice for using these bags. Be absolutely sure, before you seal up the bags, that your guns are DRY and that all metal surfaces have been coated with an effective rust-blocker, such as BoeShield T9 or Eezox. Share the post "TECH TIPS: TEN WAYS to Winterize Your Firearms"
Rimfire shooting is one of the fastest-growing firearm sports in the USA. One of the most important rimfire events of 2016 was the NSSF Rimfire Challenge World Championship held October 14-16 at the Cavern Cove rimfire facility in Woodville, Alabama (near Huntsville). Hundreds of shooters of all ages attended this fun event. At the 2016 NSSF Rimfire Challenge Championship in Alabama, Smith & Wesson was on hand with demo rifles and pistols. See the action in the S&W-produced video above. Competitive shooting is one activity in which entire families, both oldsters and youngsters, can come together in a supervised setting to enjoy the spirit and camaraderie of competition. At the October event, attendees were able to try out the Smith & Wesson® SW22 Victory pistol and the M&P 15-22 rifle. In this video, our friend Julie Golob explains the features of Smith & Wesson’s AR-style M&P 15-22 rifle. We’ve shot the semi-auto M&P 15-22 and it’is a ton of fun. It offers familiar AR15-type ergonomics and balance, with excellent reliability, and the inherently low recoil of the .22 LR rimfire cartridge. All that combines for affordable fun for the whole family. Share the post "NSSF Rimfire Challenge World Championship in Alabama"
Competitive shooting is one of the few sports where people with physical disabilities and handicaps can compete side-by-side with their able-bodied counterparts. 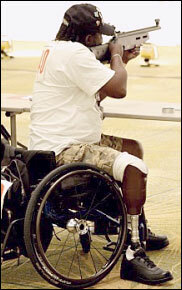 The NRA’s Disabled Shooting Services Program helps disabled shooters participate in NRA rifle and pistol competitions. The NRA’s Special Authorization Card allows disabled competitors to shoot from a modified position or wheelchair based on the type of disability or handicap. Jessi McClain, NRA Disabled Shooting Services Coordinator explains how allowances are made: “Physical limitations may prevent a shooter from getting into a certain position to compete. For example, a paraplegic person can’t shoot from the standing position, so [he] would use an adaptive shooting position to compete”. To obtain a Special Authorization Card, competitors can download two forms online. The first is to be completed by the shooter, and the second by his/her doctor. Forms can then be sent to NRA Headquarters along with pictures of the modified shooting position and/or adaptive device being used to compete. The Manager of the specific shooting discipline (rifle, pistol, air gun, etc.) then reviews the request. If approved, a temporary card good for one year is issued. For juniors, Special Authorization Cards are issued for several years at a time so that re-evaluations can be completed as children’s bodies change. The medical waiver application is fairly simple and consists of two documents. The first form, the Competitor Application, should be filled out by the shooter. The second document is a Medical Form that must be completed by the competitor’s physician. Once received, the applications are reviewed by the NRA. After approving the application, the competitor will receive a card authorizing him/her to use the adapted position or equipment. The Authorization Card must be shown to the Match Director prior to the start of any competition. Share the post "How Disabled Shooters Can Participate in NRA Competitions"